Happy August everyone! Wow, how this year is flying by. I saw school buses in my neighborhood last week practicing their routes. School starts soon and autumn is just around the corner. My youngest child will be starting college soon which is both exciting and bittersweet. Small things like seeing the school buses remind me that we are experiencing milestones in our life. Our last child going off to college means we will soon be empty nesters. Again, Wow! What milestones are happening in your life? Have you experienced the passing of a beloved pet or have you added a new pet family member ? Celebrate life and share your experiences. I’d love to hear from you! People always wonder what goes on during a normal dog grooming process. Although each grooming session is different for each pet, the majority of the process is similar. At Strutt Your Mutt Grooming, we prefer for our clients to call us ahead of time to set up an appointment. A legitimate appointment time will ensure that your dog will have complete one on one time with the groomer. A grooming appointment will also ensure a more accurate pick up time. Most people prefer this method, so that their pet is not sitting in a cage for hours at a time waiting. Once your pet arrives for his/her appointment we will ask that you provide us with a copy of the most recent rabies vaccine. We will also have you sign a grooming waiver. Read more here. Baycreek Mobile Veterinary Services-Dr. Kristen Arp 678-863-9408 www.baycreekmobilevet.com This is a great service for many people especially those with pets who are especially stressed while riding in a car or at a vet office. Or if you just like the convenience of the Doctor coming to you! Dr. Arp is warm and caring and will make your pet feel calm and safe. During her house calls she offers a variety of services such as administering immunizations, tests, microchipping, well care and more. If a service such a surgery or spaying/ neutering are necessary she will refer her client to the appropriate animal hospital. Lawrenceville Suwanee Road near 316, close to Petsmart & Home Depot. Dr. Lee Pope is a graduate of the University of Georgia which is where he received his doctorate in veterinary medicine. Now until September 1, 2014! Red Light Therapy- Free with your first massage! Light therapy pads are safe and effective. These pads can be used on almost any part of the body and the treatment time is about 15 minutes per area. This is a great add-on to any massage! 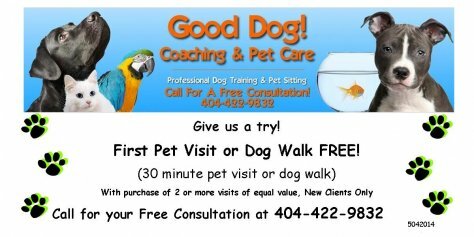 Call or email me TODAY to set up your pet's first appointment! *These fees are within my service area of 50 miles from Lawrenceville, GA 30044. If you are outside of this service area, please contact me for pricing details. Good Dog! Coaching & Pet Care has been awarded "Best of Gwinnett" for 2011, 2012 & 2013! Please help us reach our goal once again. Click the "Best of Gwinnett" link, click "Pets" on the left menu, down arrow under "Best Place to Board a Pet", select "Good Dog! Coaching & Pet Care", then hit "save". That's it! Takes less than 2 minutes. Thank you!!!! Do you have a smarty-pants canine? Does your favorite pup need a little extra stimulation or a boost in confidence? Or maybe you're just interested in finding something fun you can do to deepen your bond with your canine buddy? Welcome to dog sports, a great way to have tons of fun with your friendly dog while giving him the enrichment every companion animal needs! Agility and other sports can be enjoyed competitively or noncompetitively and will help your dog build confidence and form an uncommonly deep bond with you. Read more here. Dottie is a spunky little Chihuahua Jack Russell mix. She loves to greet the day with a stretch and a yawn in preparation for her morning walk. She lives with her mom in a beautiful retirement community where she is the official greeter. Everyone knows Dottie! She brings smiles to the faces of the other residents there and loves to say hello and get belly rubs from anyone she meets. Happy Tails Pet Therapy is a 501(c)(3) nonprofit organization. Happy Tails volunteers share the unconditional love of their pets with people of all ages with physical, social, emotional and cognitive needs at healthcare facilities, social agencies and special needs programs throughout the metro Atlanta community. Lots of outside time makes for a dirty dog! Funnybones for Dogs, located in Lilburn, is happy to offer Good Dog! Coaching & Pet Care clients 50% OFF bathing services through the end of August - that means your dirty dog will be transformed into a squeaky-clean canine! Nail trims available also. (Bonus: add $10 for a 6-day flea deterrent treatment!) Saturdays only - quick turnaround. "We were very pleased with how Keena handled our "family" while we were out of town. You can be sure we will call on you all again and will recommend you highly to our friends and anyone else who asks. " International Society for Animal Rights has declared August 16th as International Homeless Animal's Day.